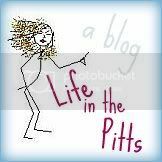 Life in the Pitts: Big Announcement!! Maybe you are and you just don't know it. You can be on that cable show about people that give birth without knowing they are pregnant. That can be you. Ok, I just totally read your about me blurp. I'm in the same situation lol My hubby is in Dental school too. Awww the joys of being students. What year is your hubby? Dang, I came here to tell you that *just might* want to check my blog :) Sorry, I got side tracked. It's only a matter of time, Helena!